Vienna has recently been crowned the most livable city in the world. It is imperial, vibrant, and the perfect host city for thrilling events. Experience the impressive scenery of historic and modern architecture at a run past Vienna's most beautiful sights. 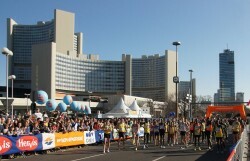 The Vienna City Marathon on 22 April 2018 will be a true theater of emotions and will host more than 40,000 runners from 125 nations. A million spectators along the route will provide the necessary motivation.